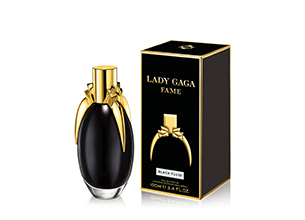 Lady Gaga Fame is the first ever black Eau de Parfum that sprays clear and becomes invisible once airborne. The black-to-clear fragrance is a fantastic innovation of patent pending fluid technology, exclusively launched with this fragrance. This fragrance has a unique structure called the “push-pull technology,” where the ingredients interact together to highlight different olfactive aspects of each note at the same time, without any hierarchy. The fragrance contains sensual notes of Belladonna, saffron, apricot nectar, jasmine sambac and tiger orchid. Availability: Selected retailers and department stores. When this fragrance first launched I wasn’t quite sure whether or not I liked it. I thought that there was so much hype around the packaging, the ad campaign and the black liquid that there was actually very little written about the scent itself. Even after a I smelt it a couple of times, I was so distracted by the hype around it that I didn’t even remember what the fragrance smelt like. This is actually a pity, as now, almost two years later I am finally appreciating the scent for what it smells like rather than for the controversial adverts and the colour of the liquid. Now don’t get me wrong – black perfume that becomes transparent once it it sprayed it incredibly cool. In fact, I would probably have bought the fragrance no matter what it smelt like, purely for the novelty of this function. But now that I am used to all the glitz and glamour surrounding it, I am happy to appreciate it just for its scent. Overall, the fragrance is warm and sensual and, for me, perfect for wintery days. It stays on your skin all day long and doesn’t need re-spraying at all. I also love that it doesn’t quite smell the same all the time. Because this scent doesn’t follow the usual hierarchy of notes, all the different ingredients take turns to come to the fore, rather than moving from top notes to base notes. I can definitely smell the sweetness of honey, but it’s the dark Belladonna that really captures my attention. If you’re looking for a fragrance that’s different and really captures people’s attention, this is the one to go for. Plus it doesn’t hurt that the bottle is absolutely stunning either! When it comes to Lady Gaga Fame don’t judge the perfume by its peculiar bottle. The rather freaky, egg shaped bottle contains a potent, black juice with notes of apricot, honey and orchid. Fame is a must-have for anyone who loves strong, sweet scents. I would recommend this fragrance for evening use during autumn and winter. Sillage and longevity are great. The liquid of the perfume is also innovative—it is colored in black but becomes invisible when it touches the skin. Very cool and mysterious. I don’t like the bottle packaging, and the lid is very scary looking. The scent is glorious, opulent wave of honey drops, saffron and apricot. A floral veil of Sambac jasmine and tiger orchid embody light and beauty. Try this out for something different from the norm. I like the smell of this EDP, although personally I wouldn’t wear it. I can think of a number of other products that smell better. The bottle and the black product itself is what first peaked my interest, but after smelling it I was slightly disappointed. However, all perfumes depend on personal taste. So if you haven’t tried this one yet, I would say its worth a go. I thought it will be a very strong fragrance, but to my surprise it actually has a lovely smell. Just not a big fan of the black colour that then turns invisible.